If you know anything about termites, it’s probably that they are nasty, horrible creatures that can devastate your home by eating through all the wood they can reach. Termites never sleep, so they are able to eat their way through your home 24 hours a day, seven days a week. The best termite prevention in Gilbert strategy may be to lure ants to your property. Ants are the biggest natural predators of termites. If you have an established colony of ants in your yard, it is highly unlikely that you will have an established colony of termites. Of course, ants can bring their own problems, so you probably don’t want to let ants run rampant in the yard. But if you see a few friendly ants, feel glad that they are on your side in the fight against termites. Not only are there significantly more termites than there are people in the world, but you may be a little frightened to know just how many termites there are. For every person on the plant, there are 1,000 pounds of termites. Not just 1,000 termites. No, that would likely only be a few pounds’ worth of termites (if that). But there are 1,000 pounds of termites. That’s a mind-boggling amount of termites just for one person. Then multiply that by the billions of people on the planet and you have a truly horrific amount of termites. In Arizona, termites are bountiful. The warm climate is very hospitable to them. Alaska is the only state in the country that has almost no termites, thanks to the very cold conditions in the state. Subterranean termites are the species that wreak the most havoc on homes, and these termites cannot survive in the Alaskan climate. Other termites can be found here, but they are not as much of a problem for homeowners. Many cultures eat termites either for nutrition or as a cure for sickness. In Singapore, people eat termite queens either live or dipped in alcohol. Some also enjoy them soaked in rice wine. Macu Indians eat termites when there is not enough food thanks to drought. Some people who live in the Amazon make a soup of boiled termites and sugar as a cure for whooping cough and they breathe the smoke of burning termite nests to get rid of the flu. The average chicken lays anywhere from 180 to 320 eggs a year. Meanwhile, the queen in an African termite colony can lay up to 30,000 eggs per day. The average termite queen can lay an egg every 15 seconds and can live from 15 to 25 years. Some can live up to 50 years in the right conditions. That’s a lot of termites over her life span! Termites can make huge mounds, nests, and tubes to live in, work and travel. Their nests can be as large as 12 inches across – and that can be right in your home. They also build mud tubes to get from their nests to the wood they eat, and those tubes are usually found outside. However, they can also be built inside. One tube was found from the floor to ceiling of a home, spanning 12 feet, and swayed with the breeze caused by the air conditioning. A mound was discovered in Africa that was 42 feet high – about the height of a two-story home. While termites have a life span much shorter than the average person, termite species have been around much longer than humans. It is estimated that the earliest humans lived four and a half million years ago, while the earliest dinosaurs lived about 230 million years ago. Meanwhile, the earliest termites are estimated to have lived 250 million years ago. Since termites never sleep, they have a lot of time to eat, and they eat a LOT. A single colony of termites can eat up to 1,000 pounds of wood each year. That’s about the same amount of wood as 650 baseball bats. Termites release gas as they break down the wood they eat, and in their waste and decomposition. Scientists say that termites release as much as 150 million tons of methane gas every year, which contributes to air pollution that can affect climate change. Not only are the vast quantities of termites bad for your home, but they are bad for the planet. A crack no bigger than the width of a penny is all a termite needs to get into your home. Therefore, it is important that you are vigilant in finding cracks in your foundation and around your windows and doors to seal them and keep termites out. As fascinating as termites may be when you learn more about them, they are still insidious pests that can wreak havoc on your home. 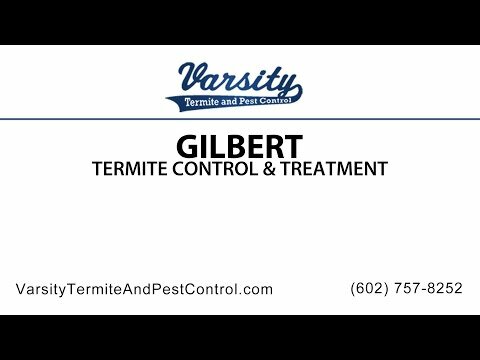 Varsity Termite and Pest Control in Arizona is here to help protect your home. We offer professional termite treatment in Gilbert and Gilbert pest control services to eradicate these pests from your home, and our professionals will inspect your home and recommend a tailored termite prevention program. Arizona is very hospitable to termites, so it is important that you are proactive in your termite prevention to protect your property. Call us today to schedule a free termite inspection or to learn about your options for termite treatment. We serve clients throughout Arizona.